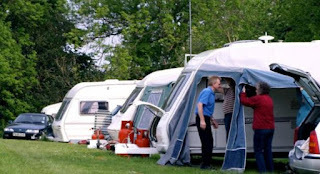 Rushmere Farm offers camping and caravanning facilities located in Crossways near the small market town of Coleford in Gloucestershire. The campsite is located on a working farm with horses, chickens & dogs and welcomes all types of campers, from tents to motorhomes. The campsite offers the following facilities: Electric hookups, luxury shower block with 7 showers, luxury toilets, disabled shower & toilet, washing up facilities. Children & pets are welcome. The local area also offers a range of attractions and activities including canoeing, The Wye rapids offer thrills and spills for the expert while the calmer areas of the river are ideal for beginners.